We were welcomed with a great weather despite of the downpour we experienced last night, during our overnight stay in Banana Island. We left Banana Island for another island hopping. 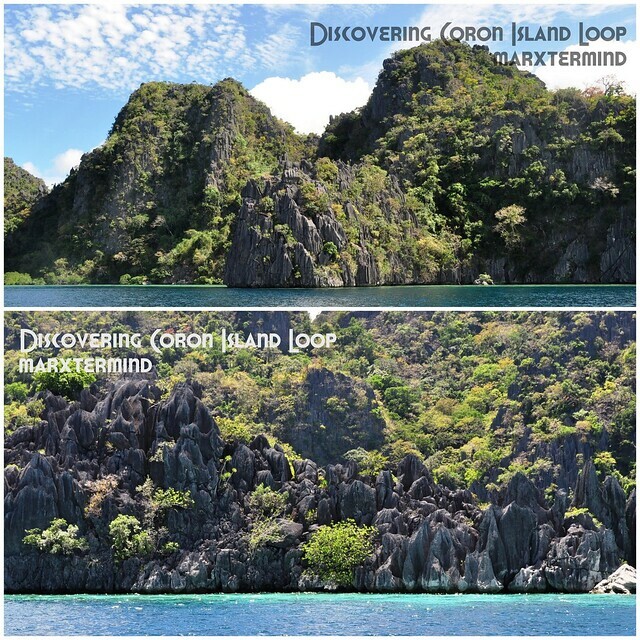 The day for discovering the loop of Coron Island. 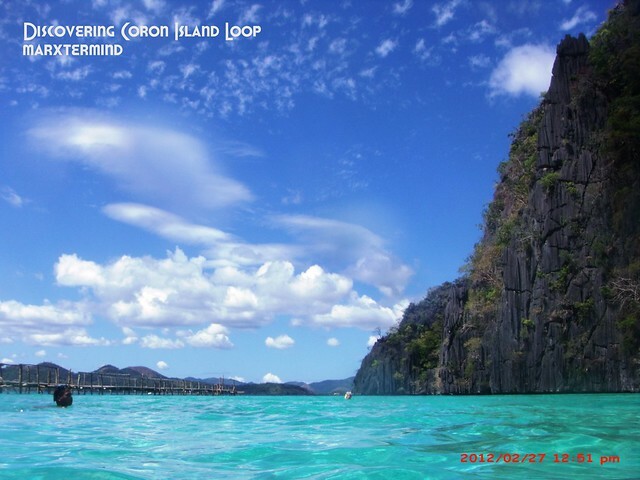 Coron Island is also known for rock formations and shipwrecks making it famous for snorkeling and wreck diving. We sailed the sea for almost an hour, thinking the worst ended on our camping experience last night but our boat ride added up another thrilling experience on our travel. We’re sailing against the waves making the waves splashed into the outrigger boat and to ourselves, as well. I didn’t see it coming, and didn’t even realized why our boatmen put our bags into the chamber. I forgot to bring out my big garbage bag so I can placed myself inside while sailing the big waves. I just wondering, why isn’t there a gear or suit to protect one from being soaked by big waves splashing during the boat ride? We were very wet caused by sea waves and it was very cold. When I saw that we’re approaching the island, I felt relieved. The waves got smaller and the waves splashing into our boat has lessened. There are small beaches in the Coron Island and its surrounding but we settled ourselves somewhere (which I forgot the name) near the Skeleton Wreck. We took our lunch here and did some snorkeling. It’s my first time to see a shipwreck and I was really envied with my friend who dived to get near the ship wreck. I know how to swim (a little) and I would like to dive and get near of it but I was still in doubt since it’s really hollow. Also, I can’t see clearly because my lenses are not on which made me decide not to go and just do it the next time. I know there’s still next time for Coron. And I’ll bring graded goggles for myself, so I can see the underwater world clearly. There’s an entrance fee of PHP 100.00 for this island and the shipwreck. After lunch, we skipped the small beaches surrounding the island and moved on to Twin Lagoon. If you want to experience the sand more and sun bathe and swim near the shore you may go to these small beaches but these have entrance fee to pay to which is usually PHP 100.00. Banol beach and Atuayan beach are one of those if I’m not mistaken. When the boat made a turn way to our destination, the scenic rock formations and limestone cliffs that I used to see online fronted us. 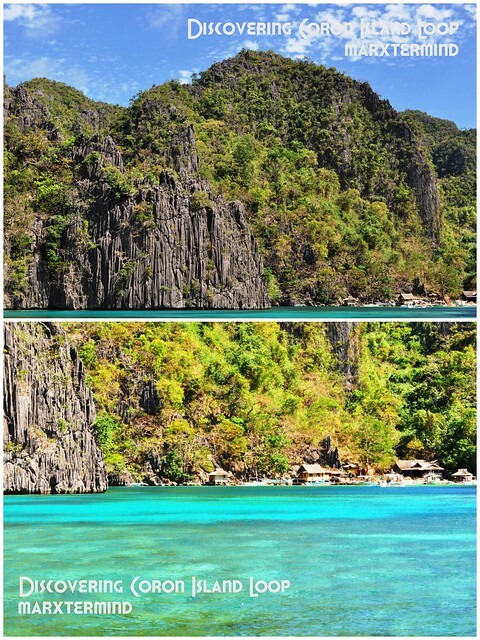 I’m in in awe seeing those rock formations scattered in the sea and surrounding the Coron Island. My friend even said it resembles the movie, The Beach while seeing those. And I said this is even better (assuming I’ve been to Phuket). Without further sailing the sea we got to our most anticipated destination, the Twin Lagoon. Twin Lagoon is named such because it’s composed of two lagoons (inner and outer). Based on what I’ve read and saw online, there’s a small opening to get inside the other lagoon which really sounds exciting but it’s high tide making it impassable for those who doesn’t know how to swim. But no need to worry since a ladder has been placed to get to the other side which makes it easy for everyone. But swimming into the small opening to enter to the other lagoon sounds really very exciting, I would like to try to but I was in doubt again because I can’t see clearly under the sea. Anyways, there’s still next time for me to try it. 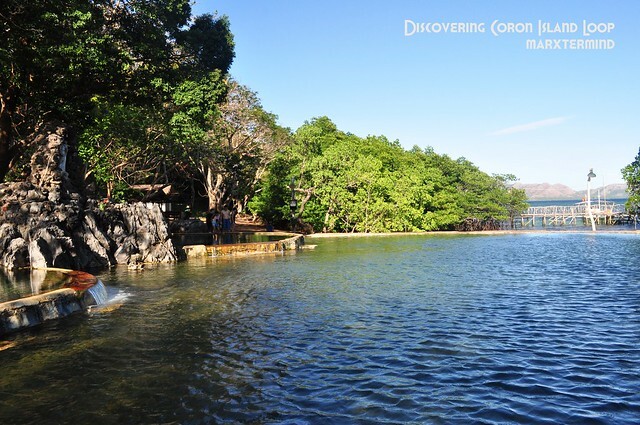 Entrance fee for the twin lagoon is PHP 100.00 each. I felt wow as soon as I saw this view of the inner lagoon. I can’t wait any longer and had myself plunged to the water and did some snorkeling. My companions were too excited to explore the lagoon that they forgot to tag me along. I was left alone finding them. I can’t really find them because of my blurred vision, I didn’t want to shout their names to find them because I didn’t want to make a scene in the lagoon. So I swam and stroked until I got to this place. Another wow moment. Then my friend approached me telling me that their looking at me, thank God I was with someone now. I got tired from swimming. It’s very tiring stroking and swimming but it looses whenever I see the scenery on the surface and the view under the water. After awhile we’ve decided to go back. 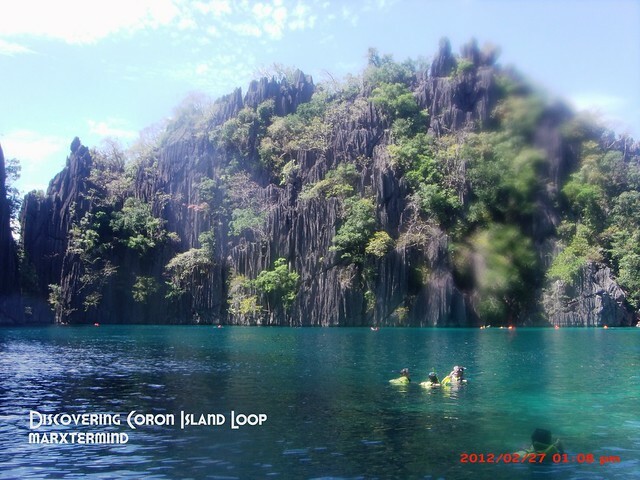 It’s hard to leave such wonderful place but we need to go for another amazing spot surrounding the Coron Island loop. We skipped Barracuda Lake because our boatman Kuya Jason told us that Barracuda Lake is better for diving. And since we’re not into diving (or can’t afford to do so) that time we skipped it and moved on to Kayangan Lake. Also, we didn’t want to pay another PHP 100.00 for entrance fee and we were already overwhelmed by our snorkeling experience at Twin Lagoon. 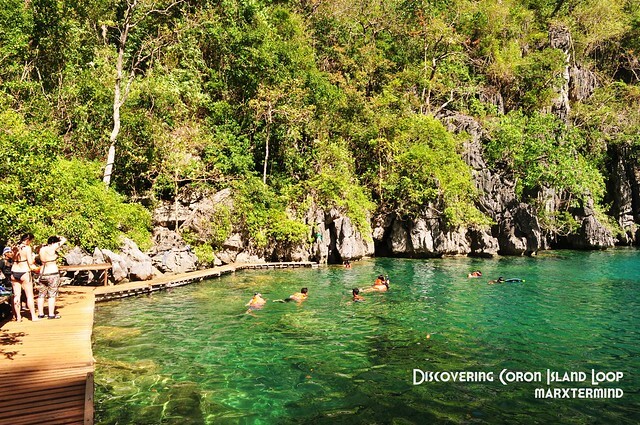 Kayangan Lake is known to have the cleanest inland body of water in the Philippines. 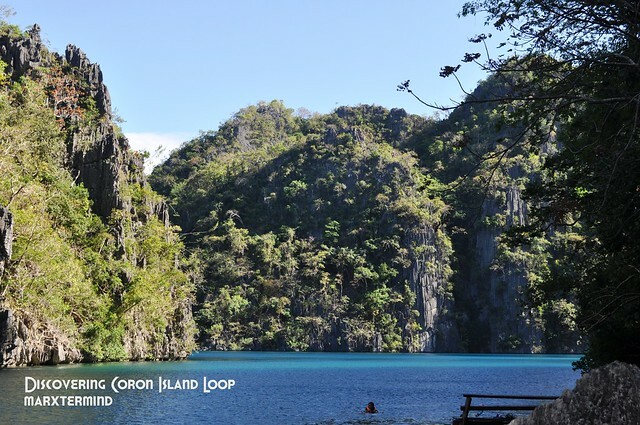 One must trek number of steps up to get to this place which I always see whenever I searched for Coron online. Picture perfect, isn’t it. We then moved down and get to the actual Kayangan Lake. It was huge, bigger than the twin lagoon. We planned to get to the other side but we decided not to because no one gets there that time. Our boatman Kuya Jason told us that there’s another and bigger lake within the Coron Island which is not open for public yet, the Cabugao Lake. According to our boatman the lake is sacred for Tagbanuas. An octopus is also living alive in that lake according to our boatman. I was really tired from stroking. My knee is already aching from an all day swimming and snorkeling. After Kayangan Lake we’ve decided to skipped Siete Pecados. I was already tired. I asked our boatman what to do in Siete Pecados and told us it’s another spot for snorkeling. Thinking we had too much for snorkeling for the day so we just passed by it and went straight to Maquinit Hot Spring. We then dropped by at Maquinit Hot Spring before we went back to the town proper. Entrance fee is PHP 150.00 per person. The place has large pools warmed by the geothermal water spring in the area. It’s a great place to hang out in the evening after a long day of activities. It’s also accessible by tricycle from the town proper but we opted to get to this place right after our day of discovering the Coron island loop to save money for tricycle fee and of course time. Boat can only have access to this place when the sea is high tide. The water was really hot! It took time before I submerged myself into the water. This is truly relaxing after all. We only spent 30 minutes here as what our boatman asked to because it will get low tide anytime sooner. So after de-stressing ourselves from the hot spring we went back to our boat and went to the town proper. 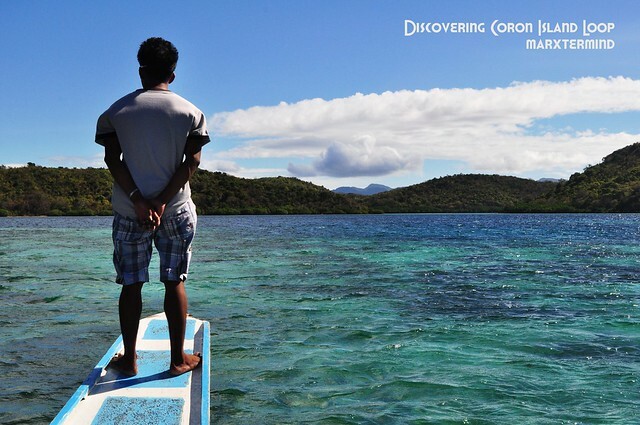 It was an astounding day discovering the spots surrounding the Coron Island. It was my best snorkeling experience so far. 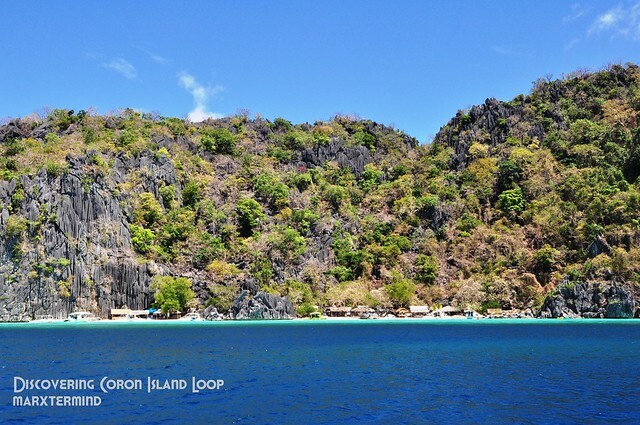 Coron has still a lot more to offer. Two days wasn’t enough to discover each island in Calamian group of Islands. The scenery and experience will surely make me go back to this place. Wow talaga! 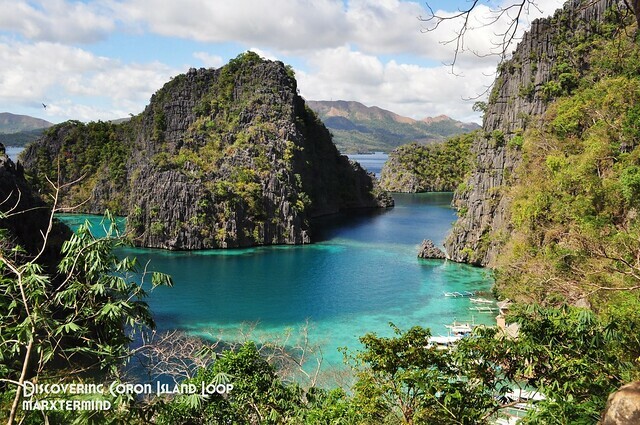 Ang ganda ng Coron… sana makapunta din ako dyan. Uber sa ganda ang nature scene lalo na yung rock formation walls na shots ang gaganda – post-card pretty lahat. Ang gaganda ng kulay lalo na yung dagat. Nice trip report. I have seen many posts about Coron, and your photos are probably the best I've seen! I am going to do the loop in late-April. Thanks for that tip about skipping Barracuda Lake (not into diving either). If I may ask, what camera do you use? Ung officemate ko nga manghang mangha sa mga shots ko sabi ko hindi maganda lang talaga yung place kaya maganda ung pictures ko. Hehehe! 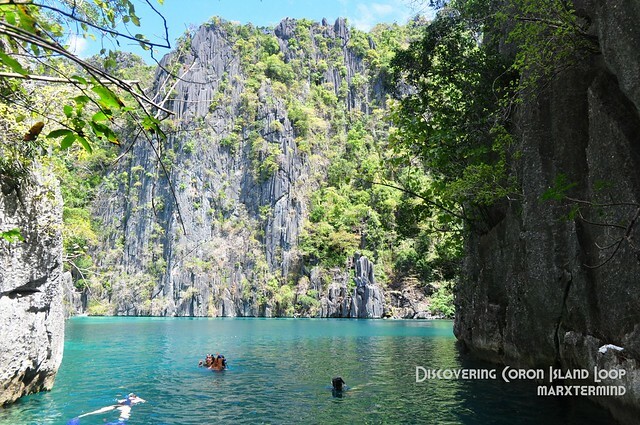 Ang ganda nga ng Coron. Nakaka-amaze. Sobrang picture-perfect. Kahit yata pipitsuging camera lang gamit mo, lalabas pa rin na maganda ang shot. Di para sakin ang diving, di ako marunong lumangoy. Hehe. Yay! Hmm, May 12-16? Let me see. Di ko pa alam schedule ko e. Pero try ko. Sa Albay ako. Ikaw, san ba itineraries mo? Yes super kapagod but all worth it. Coron is one of the place I'll keep on coming back! 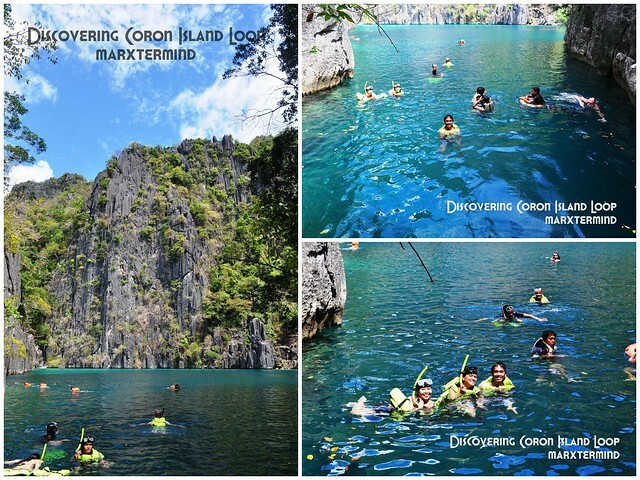 Coron always a marvel as a gift to all tourists and locals! I bet anyone who gets to Kayangan Lake would fell in love to stay! I missed Coron! It is safe. Kaso like you, kapagod lumangoy ng almost a day due to whole day swimming but all worth it! gusto ko din mag El Nido! Sumakit kasi ung tuhod ko pero pag nasa dagat ako di masakit pero pag umahon na dun sumasakit. Kelangan ata nasa dagat lang ako. Hahaha! 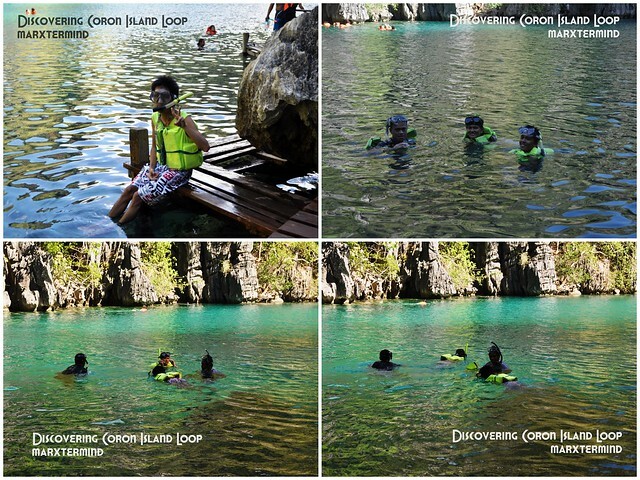 dami ngang wow moment pag nasa palawan at lalo na sa coron. ganda ng tubig tapos impressive ang mga taraw. kaya din nakukumpara to sa el nido. 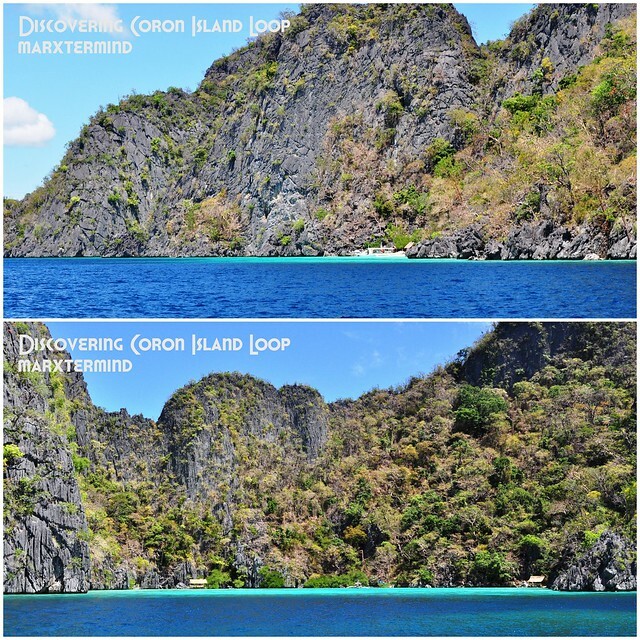 grabe ang coron, walang kupas. breath taking..
kitang kitang blurred nga ang paningin mo marx. hahaha! Obvious sa 1 pic sa twin lagoon. hahah! 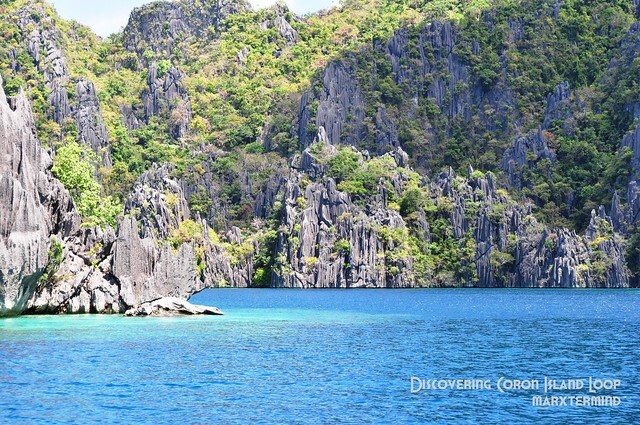 Ganda ng coron diba? Nakaka-adik. Sayang at napagod ka na. Puyat ka kasi e. lol! Maganda ang Siete super daming fish. Try natin mag diving minsan. Btw, kuya Jason will be in Manila this April. Nagtatanong sakin ng mgandang punatahan sa Batangas. Baka may alam ka.